Design your channel to help viewers immediately understand what type of fashion/beauty videos they can expect and encourage them to subscribe. The beauty and fashion community on YouTube has already created several native video formats that audiences respond to. Consider plugging into those first, and investigate the niche content that's already thriving on YouTube. Get to know the style of videos and language of the community. Knowing the culture of the community is essential to providing content that will resonate with them. Explore popular channels and understand what types of videos appeal most to your target audience. Experiment with existing formats and expand on them. You don't have to reinvent the wheel. Test out some “tried-and-true” formats, and see if you can bring something new to them. Organize similar formats into playlists. Some successful creators use playlists to organize videos that belong to the same series or a format they use often. Consider featuring your most popular playlists on the channel page. Amenakin (top) is a popular Middle Eastern channel specializing in hijab style and tutorials. BubzBeauty (bottom) includes nail design tutorials in addition to hair and makeup. Many successful channels use formats and keywords for their videos that are well known to their community. This chart shows the prevalence of formats based on video metadata keywords. The top six formats listed above are: how-to, tutorial, hair, haul, beauty and give-away. YouTube’s most popular beauty and fashion channels often feature a single personality with whom the audience builds a strong connection. Beauty and fashion viewers want to take advice and learn from someone they can relate to. Connect with your community on a personal level. Some creators have found that interacting with viewers in as many ways as possible can build a sense of community. Try hosting a live stream with top fans and offering personalized beauty advice directly to your audience. Be yourself. Viewers are typically drawn to authenticity. Many top creators have found that by being yourself, you can help build strong connections with your community. The top beauty and fashion channels are dominated by unique and engaging personalities. They often build a personal connection with their viewers through interaction. If your channel features a strong personality, find ways to showcase that. 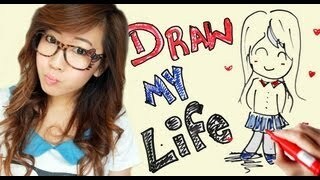 The “Draw My Life” videos series offers a great way to share an authentic personal history with viewers. Viewers often want a taste of the end result so they'll know whether you're offering something that they can apply to their own look. Many successful creators recognize that a preview can get their audience interested enough to watch their video all of the way through. Creators often feature the finished look in the thumbnail. That fabulous final result may inspire viewers to take the plunge and watch the whole video. Preview the end result early on. As with thumbnails, showing a finished look early in the video can create an incentive to keep watching. Write descriptive titles. Consider titling videos so that they explain what the video will cover and include the most important keywords. Within the first 15 seconds of the video, viewers see before-and-after images of the hairstyle, which allows them to decide quickly whether they want to watch the full tutorial to get the look. Their thumbnails often include multiple angles or variations of the style, such as this one which is titled, “How to create a Crown Twist Braid | Updo Hairstyles”. Successful beauty and fashion creators rely on a visually polished look and consistency to strengthen their online brand. Upload a channel icon and banner that match your branding elsewhere on the web. Consider using a design program or hiring help to ensure a professional look. Upload a channel trailer, explaining what your channel is about, to convince new viewers to subscribe. Keep your channel description up to date so you can inform new viewers about your channel. Try including links and other relevant information. Consider using your logo or tagline in your videos’ intro or outro sequence to reinforce your brand. Learn more about branding. Keep a consistent upload schedule and communicate to your viewers when they can expect your next video. Yuya has turned her name into a recognizable commodity by including it at the end of every video title. More than 20% of Yuya’s viewership now comes from searches for her name. 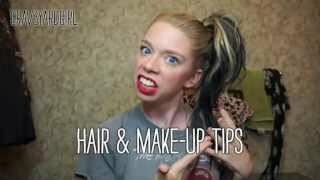 GRAV3YARDGIRL shares her unique, "messy and imperfect" sensibility from the outset of her channel trailer. She invites viewers who like her style to become part of her "swamp family."